Turbos! They defined '80's performance cars and reshaped the way people thought about small displacement engines. Arguably kicked off by Porsche with its infamously lethal and creatively named 911 Turbo, turbos went from curiosity to serious horsepower in a very short time. 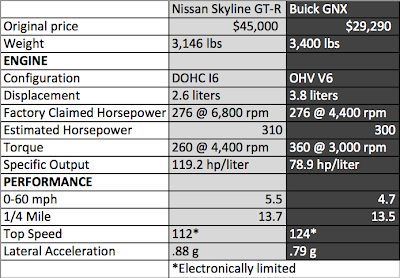 Today we're comparing two very different and highly developed turbocharged cars of the same era, the 1987 Buick Regal GNX and the 1989 Nissan (R32) Skyline GT-R. It's east meets west, pushrods meets camshafts in this ridiculous bench race to determine which late '80's turbo coupe is the meanest. 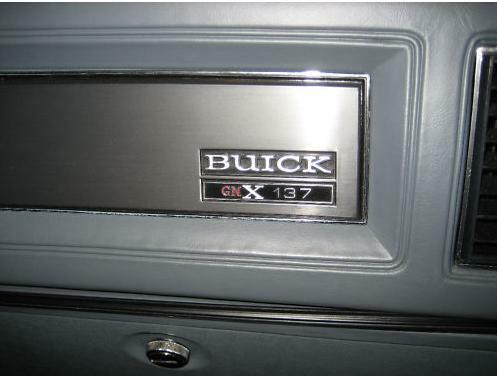 Let's start alphabetically with 'B' for Buick. Buick had been tinkering with turbocharging since the early '80's and by 1987 they had reached their peak. 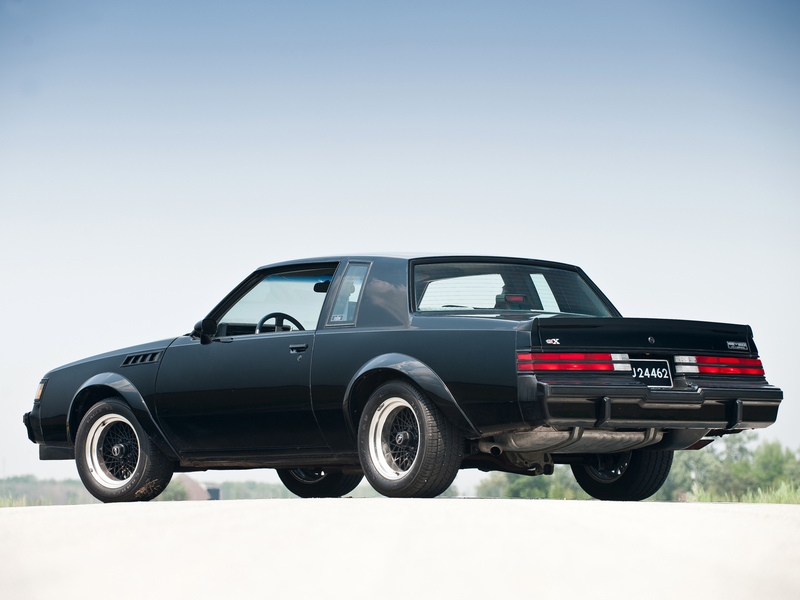 (More Buick turbo goodness can be found here) The rear-drive Regal platform was scheduled to be replaced with a front-drive one for 1988 and Buick wanted to send it out with a bang. Buick sent just 547 Regal Grand Nationals to McLaren (Yes, that McLaren) to be turned into fire breathing monsters. The sinister looking Regal received a special Garett T-3 turbo, larger intercooler, freer flowing exhaust, a revised transmission and host of suspension upgrades. It was one bad Buick. Over in the Nissan camp, they wanted to go racing and do so with a technological tour de force. The 1989 Skyline GT-R was their creation. Built to annihilate the competition for Group A road racing it showcased every bit of go-fast engineering Nissan could muster. From top to bottom, the GT-R was a weapon. Power was sent through all four wheels via Nissan's nerdy and amazing ATTESA AWD system. All GT-R's were sold with five-speed manual transmissions. Bold fender flares were created to house the 10 inch wide tires on all corners and a rear wing was fitted to increase downforce and stability. But it was the engine that was really impressive. Displacing 2.6 liters with two T28 turbos to boost it, the GT-R's DOCH straight six was a beast in street or race trim. Factory rated at a laughably low 276 horsepower as per the Japanese car manufacturers "gentleman agreement," the GT-R's true output is believed to be around 310 horsepower. Like the GNX, these engines are very robust and with extensive modification they can exceed 1,000 horsepower. The GT-R was nicknamed godzilla after it's utter dominance of the Japanese Group A and Australian touring car race series'. The GNX also used turbocharging and had six cylinders but that's about where the similarities end. The GNX's 3.8 liter engine was a V6 and used a solitary turbo to produce a factory rated 275 horsepower. Most people with a brain and a calculator will realize that 275 horsepower does not move a 3,400 pound car to a sub five second 0-60 time. The true output is probably around 300 horsepower. Unlike the GT-R however, the GNX produces an earth moving 360 lb/ft of torque at just 3,000 rpm. It might be a powerhouse but it's no high winding mill. But how do these opposite ideologies of internal combustion translate into accelerating forward momentum? Let's start with the Skyline. It carries 255 pounds less than the GNX, has an advanced all wheel drive system and a five-speed manual transmission. With both turbos spooling, the GT-R will hit 60 mph in 5.5 seconds and cross the 1/4 mile in 13.7 seconds. These times are still fast today and are remarkable for a late '80's car not built with straight line racing in mind. The GT-R is electronically limited to 112 miles per hour but with the limiter removed, speeds of over 140 mph are easily possible. The GNX, on the other hand, was built for maximum acceleration and does so with ferocity. In just 4.7 seconds, the GNX rockets to 60 mph and it covers the 1/4 mile in 13.5 seconds. 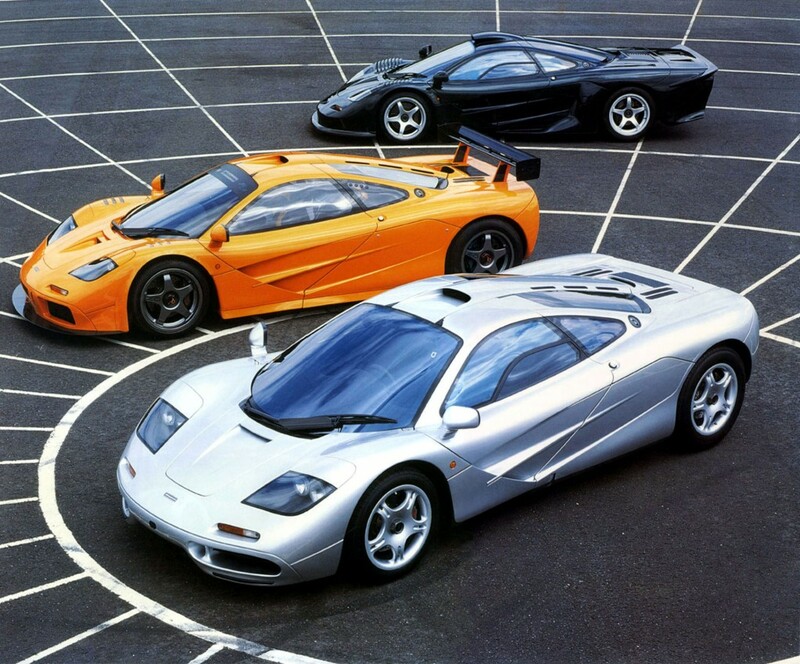 These cars were only sold with automatic transmissions so they could shift without losing boost. Top speed on the GNX is electronically limited to 124 mph but with the Regal's barn-door aerodynamics you'd have to be pretty brave to go beyond that. Despite the GNX's impressive straight line speed, it all falls apart when the going gets twisty. The GNX uses a stiffer suspension with thicker anti-roll bars and wider tires than the standard Regal. Though its .79 g of maximum grip is impressive, it's nowhere near as capable as the superhuman GT-R. It might be the best handling Regal ever made but that's sort of like being the tallest dwarf to ever live. The GT-R, however, wooed reviewers and dominated racetracks with its handling. The Skyline is capable of an impressive .88 g of lateral grip. Praised as being one of very few AWD cars of the time that didn't "push" the front end around turns, the GT-R is a neutral handler and fairly easy to drive fast. It's manual transmission is certainly easier to manage around a road course than the GNX's automatic. In culmination, we have two highly developed turbo cars from the late '80's that excel in different aspects. The Buick is an old-school drag strip warrior that gets its speed from new-school technology. Alternatively, the GT-R is almost as quick as the GNX in a straight line and is also quite capable of going fast through the twisties. So which one would you choose? 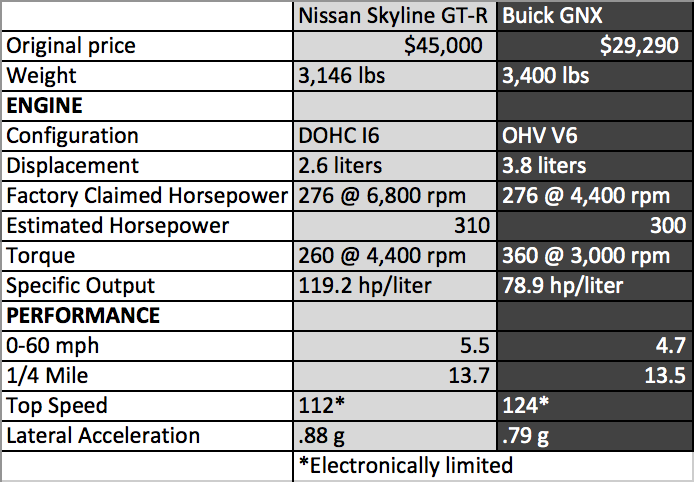 Which two cars should we compare next?